Luke Tillen is already a hero to many people across Devon and the rest of the country, Now the 37 year old proprietor of the Hotel De La Mer in Babbacombe has become a super hero, demonstrating superhuman powers by running over 100 miles in just over 25 hours to change the lives of those who need him. Luke is the popular founder, chairman and co-ordinator of the charity Torbay Holiday Helper’s Network (THHN). He works tirelessly to inspire his colleagues across Torbay and the UK’s holiday industry to donate their portion of a holiday, be it a hotel room, attraction visit, steam train ride or food to a family who face life threatening illness or have been recently bereaved to give them the holiday of their dreams and a chance to make precious memories that will help them through the challenges of their day to day lives. Since the first holiday in 2009 Luke and the THHN have given holidays to over 400 families but Luke has always known there are families who really need the break the THHN offer but, due to the severity of their child’s or a parent’s disability, cannot stay in the accommodation THHN members have to offer. 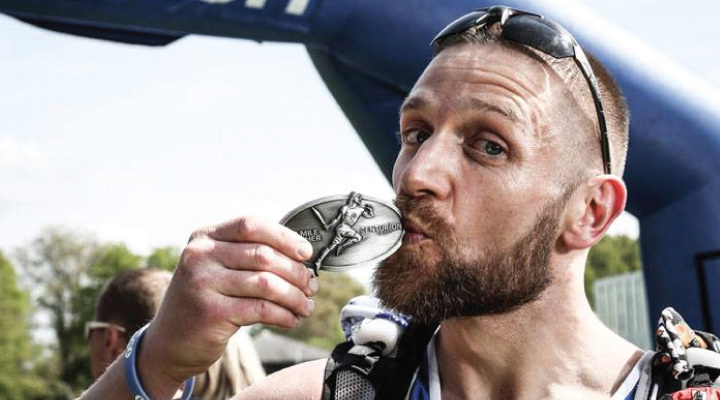 Luke is aiming to raise a million pounds to provide a specially adapted bungalow, Luke joined the Centurion Running Thames Path 100, a 100 mile ultra marathon starting in Richmond, near London, and following the River Thames to the centre of Oxford. The race began at 10.00am on Saturday (May 3rd) and runners continued all night and into the following day. Luke has been training for the race for 3 years, including running at night to acclimatise to the disorientation of running in the dark, especially with exhaustion and running with his four sons in specially adapted buggies, often pushing two boys at a time. Luke finished the race in a time of 25 hours and 22 minutes, placing 107th out of 350 competitors from 16 different nations across the world, 36% of the competitors did not finish the gruelling race, which saw night time temperatures drop to 2 degrees. So far Luke’s mammoth run has raised over £4,800 towards the bungalow. You can add to this fantastic total by donating online here.